The online version of this article ( https://doi.org/10.1007/s00277-019-03680-4) contains supplementary material, which is available to authorized users. TP53 mutations are early events in the pathogenesis of acute myeloid leukemia (AML) and TP53-mutated AML has recently been classified as a distinct subentity [1, 2, 3]. 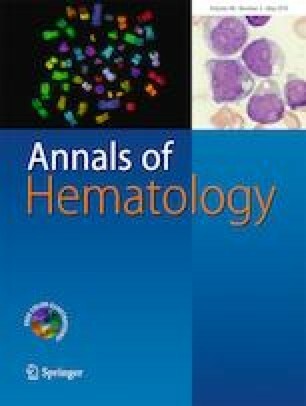 An increasing number of reports postulate that the bone marrow (BM) microenvironment of patients with myeloid malignancies contributes to both leukemogenesis and therapeutic resistance . As disease-specific, somatic aberrations have been reported in cells of the BM microenvironment in these disorders [5, 6], we hypothesized that BM-derived mesenchymal stromal cells (BM-MSCs) are also affected by leukemia-specific mutations in patients with TP53-mutated AML. The study was approved by the ethics committee of the Medical University of Graz, Austria, and written informed consent was obtained from all patients. Diagnostic, vitally frozen BM specimens from 13 AML patients with somatic TP53 mutations were used for BM-MSC culture (Supplementary Table 1) . One specimen from a patient with Li-Fraumeni-syndrome suffering from therapy-related AML served as a positive control. In accordance with previous reports, these leukemia specimens revealed a complex karyotype (12/14; 86%) and a paucity of cooperating gene mutations (median, 1; range, 0–3) . As outlined in detail in the “Supplementary Methods,” ex vivo culture of mononuclear BM cells was performed under low oxygen conditions (3% pO2 and 5% CO2 at 37 °C) with the addition of human platelet lysate. Adherent cells representing BM-MSCs were cultivated up to a maximum of 4 passages. To obtain pure cell populations, they were further subjected to cell sorting by FACS (FACSAria, BD) using the human monoclonal antibodies CD 73, CD105 (Bioscience), CD90 (Biolegend), and CD34 (Biolegend), CD45, CD14, and HLA-DR (all Beckman Coulter), respectively. In addition, their adipogenic, chondrogenic, and osteogenic differentiation capacity as a characteristic feature of BM-MSCs was demonstrated (Supplementary Fig. 1) . Patient-specific TP53 and cooperating mutations were analyzed in both AML and purified BM-MCS specimens, using the error corrected, high-resolution “Safe-Sequencing System” method as described previously [1, 3]. In AML specimens, somatic TP53 and cooperating mutations were found at variant allele frequencies (VAFs) between 1.5 and 91.2%. 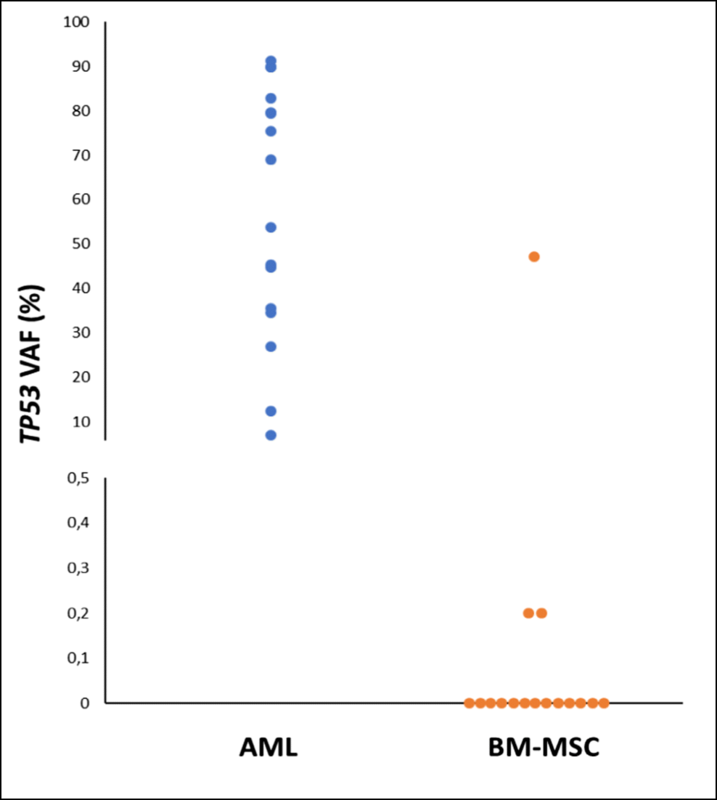 In purified BM-MSCs, the leukemia-specific TP53 mutation was detected in 2/13 patients (15%) at VAFs of 0.2% each and confirmed using biological replicates (0.2% and 0.1%, respectively) (Fig. 1). However, apart from one single nucleotide polymorphism in TET2 (c.100C > T, p.L34F [rs111948941], sample #7479), no leukemia-specific, cooperating mutation was detected in BM-MSCs in any of the specimens analyzed (Supplementary Table 2). The detection of somatic, leukemia–specific TP53 mutations in BM-MSCs of AML patients may indicate that these mutations have arisen in common mesodermal ancestors of hematopoietic stem and progenitor cells and BM-MSCs . It further supports the concept of TP53 mutations being early events of acute myeloid leukemogenesis. The demonstration of BM-MSCs affected by leukemia-specific mutations—albeit at low VAFs—might also have practical implications as these cell types are increasingly used as a source of germline, control DNA . Future work will focus on the functional role of the bone marrow microenvironment in this distinct AML subentity. This work was supported by “Anna-Maurer Fund” and the Austria Science Fund FWF (P 31430-B26).